The Master Boot Record (MBR) is quite possibly the most important piece of data stored on you hard drives or USB flash drives. For those that aren’t exactly sure what the MBR is, it’s basically a small dedicated section of the drive which holds vital information about the disc including its boot information and the layout of all the partitions stored. The MBR area itself is tiny being only a 512 byte sector and is the very first piece of information held right at the beginning of the disc. If your Master Boot Record becomes corrupted through drive errors or malware etc, it could stop you booting your operating system and in the worst case, cause all the partitions on the drive to be lost because the drive doesn’t have the correct information to identify them. If your system has a standard disc layout, it’s always possible to write a new standard MBR using the Windows XP Recovery Console and the FixMBR command. Or you can use a Windows 7 install disc and select the “Repair your computer” -> Command Prompt option with the Bootrec /fixmbr command which also works on Vista and Windows 8 from the Windows 7 disc. As the Master Boot Record is such a vital part of your system, it makes sense to have a backup of it just in case the worst happens. And being only 512 bytes in size means it takes up no room at all and can be stored anywhere. This could save hours of frustration trying to recover your files from damaged partitions. So here are 8 free tools that can help you to easily backup and restore your system’s Master Boot Record (MBR) for some extra piece of mind. MBRwizard is quite a powerful utility and can be helpful in dealing with all sorts of MBR related problems. It was originally designed to repair the damage left on occasion by disk imaging applications such as Symantec Ghost and Acronis True Image, but has matured into a program to repair all sorts of MBR related issues. It also supports GUID Partition Tables, removable media and VMware disks. Backing up and restoring an MBR is easy with the Save and Restore commands with optional use of Vol/Disk. 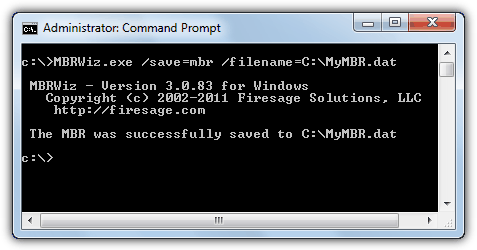 The same command change is present with MBR restoration. As a result of this change, some of the old MBR Wizard GUI frontend tools (MBRWhisky/Ultimate MBRGUI) won’t work if you update the MBRWiz.exe they come with. The MBRwizard command line version is freeware, and there’s also a shareware version with its own frontend, which might explain the command change, to make the old freeware frontends useless!?? BOOTICE is more of a general boot sector/MBR editing tool because it has a lot more useful options for advanced users and is quite a powerful tool. There are extra features such as a Grub4DOS menu editor, disk and sector wiping tool, visual BCD editor for NT 6.x systems, edit the MBR/boot sector of IMG, IMG, VHD, VHDX and VMDK images, a partition manager and a disk sector editor. The options to backup and restore the Master Boot Record or the Partition Boot Record (PBR) are via the Process buttons on the Physical Disk tab and you can also install a boot loader from a variety of different choices such as Plop, Grub4DOS, NT 5.x/6.x and BOOTMGR or NTLDR. The 1st sector or as many as you wish can simply be backed up to a file ready to restore later on. As well as the portable GUI, BOOTICE has extensive options available from its command line. 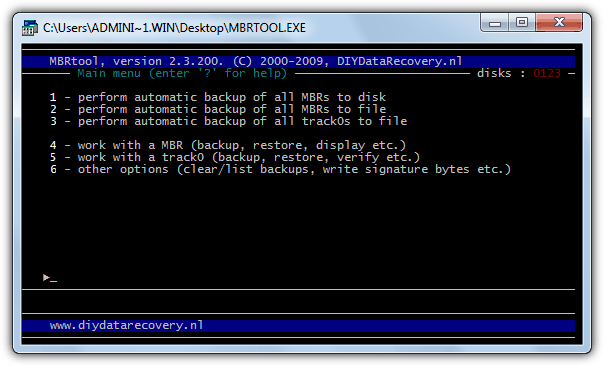 MBRtool is a utility that runs in DOS and is designed to backup, restore and verify your hard disk’s Master Boot Record. In addition it can also edit or wipe the partition table and blank or remove the boot code. MBRTool will support the first 4 hard drives present in the system. The program comes with its own bootable media builder where you can write an image to floppy, burn it to a CD or extract the MBRTool executable to be used on the command line or in scripts. Backing up and restoring is menu driven and easy to operate if you enter no arguments or double click the EXE while the more manual commands can be used like any other command line tool. HDHacker is a much more user friendly tool with the Windows GUI making it very easy to backup and restore the MBR with a few clicks. It’s able to backup and restore the Maser Boot Record to the physical drive, the boot sector from a logical drive or a specified number of sectors up to a maximum of 16. They can be saved to a file or loaded back in and written to just about any type of drive. Although it will probably look like a mixed up mess in the viewing pane to most people, others may be able to trace problems or even possible boot sector viruses from the information. I am running on Windows 7, every time I have to repair my MBR for a successfull boot. Is there anything which can permanantly repair my MBR please? Some weeks ago I downloaded Bootice without any problems, but some days ago my antivirus deleted it because I tried to unhide a partition, so the antivirus classified it as a suspicious malware operation and deleted it automatically. Unfortunately I didn’t make a backup copy of the program, so I tried to download it again from the link given there, but the server (bbs.ipauly.com) gave me a “500 Internal Server Error”. I tried so many times but that server is still not working. Could you please help me and give me another link? The link has been updated with an alternative download page. Ok, thanks very much, another time you suggested me a very good software. Keep this blog going. Is it possible to copy all bootfile from a bootable usb with this? I need to make a pcmcia card bootable with fat16, dos and haven’t found any tool having support for pcmcia in dosmode…. I did create a restore point just yesterday and also made a full files backup, but MBR was corrupted and when starting windows I only get the “Dell Utility Boot Menu”. Can I restore the MBR even if I don’t have a saved MBR specifically? Can someone tell me how to fix my Dell USB Portable HDD? I try to fix it with HDD Regenerator but it is said “Master Boot Record of this hard drive is Damaged!”. It’s probably because of my HDD fell (but still hang on the USB cable) and hit the other thing when still working on my notebook. Is it possible to fix my HDD now..? See my (pol098) response to the same question below; even the fiorst sentence is unfortunately still relevant: “Probably too late for the asker of the question, but often a standard MBR is used …”. A good tool for manipulating the MBR is BOOTICE. Probably too late for the asker of the question, but often a standard MBR is used, and there are several tools to create one. There are also tools that can help in the case of a non-standard MBR; they require a fair amount of experimenting. Unlike other disc corruption, you can try several possible MBRs without too much risk of damaging the data on the drive (which you can’t get access to until you’ve sorted out the MBR). This reply should be moderately helpful despite not naming the tools (I haven’t done this for a very long time); if you know that something can be done, it’s not too hard to find out how. Yes, of course you don’t keep the copy of the MBR on the C: drive, we were just using that as an example location. It’s like backing up your files or hard drive, you store it in another location so you can restore after a severe problem. There’s always the possibility that you did something which damaged your MBR but did not wipe your backup off the drive. i made damage to a friends usb and i owed 3000 rs .u saved meeee. Hi Raymond. Which if any of these tools will allow me to move a missing mbr from an older computer to a new computer? For instance, when running a specific program, the program will not continue because it says \grldr.mbr is missing. Thanks for your response in advance. There’s plenty of these tools mentioned on Hirens Boot CD, you can boot with that and restore a previously saved MBR to your drive. Trying to use an MBR off another hard drive won’t work because an MBR stores drive and partition data as well, so you’ll screw up the whole partition. Does the MBR change whenever files are modified on the drive? Just wondering if regular backups should be made. No, the MBR only changes when you’re doing something like formatting the drive, creating/deleting partitions or installing Windows. Thanks for the list, just what I needed. Excellent stuff! I have used mbrwizard for years, and am very pleased with this little app, but it’s always nice to keep up with the various technologies. Thanks for your willingness to test and share! this is a fantastic find! MBR definitely needs back up and your list offers a perfect solution. Amazing article as always, you rock Raymond. No matter how much we know – there are always things to learn. This sort of concise explanation is helpful and right on the button for the huge number of members who have little expertise or in-depth knowledge of the vaguaries of harware and software. Thank you from all of them. Thanks for the article, just when I need it. very useful tips.. when my MBR gone, i had to reformat my pc .. but now i didn’t need to reformat … just restore the MBR.